**Transactions excluded from point calculation include cash advances, ATM withdrawals, convenience checks, and balance transfers, any fees and card-related charges posted to a Card account, tax payments or any unauthorized charges or transactions. Avidia Bank is not affiliated with any retailer participating in the bonus point program. Avidia Bank reserves the right to change the program at any time. In 2015, Avidia Bank began working with the NEPGA section to bring you a menu of financial products to help you grow both personally and professionally. The MasterCard banking site dedicated to the NEPGA will allow you to access your account information, manage rewards points, make payments and do general maintenance. What are fees and other restrictions? How are reward points accrued? Initially you’ll receive 16,000 points after your first NEPGA credit card purchase and annually thereafter. You’ll earn 3 points per dollar spent on travel related expenses (gas, hotels, flights, restaurants) as well as on all other purchases. How do I apply for the MasterCard? 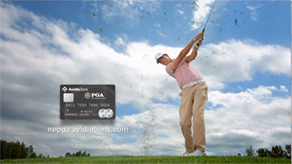 Login to the NEPGA Section Website at www.nepga.com, located on homepage and you’ll see an image of the MasterCard. Simply click on it and it will take you to a landing page which describes the card benefits in detail. On the bottom of the landing page, you'll either apply as a Business or a Consumer, which in turn will take you to an application. Please complete all required sections of the application and E-Sign (Electronic Signature) in the space provided. Once complete, it will be securely transmitted to Avidia Bank for processing. How long will it take before I know if my request has been approved? If you have applied for the Business Card, it may take additional time for us to verify information regarding your business in addition to requiring and vetting supporting documents to assist in the decision making process. It's important that we know the structure of your business, e.g., Sole Proprietorship, Partnership, LLC, S or C Corp. I just acknowledged my MasterCard request, how long will it take for me to receive my card? Typically, 7-10 business days. When you receive it please call the activation number attached to your new NEPGA MasterCard. I received an email denial regarding my MasterCard request, can I be reconsidered? I received another email from Avidia/EchoSign asking me to acknowledge my request for the MasterCard, what do I do? How is my rate determined for my MasterCard request?